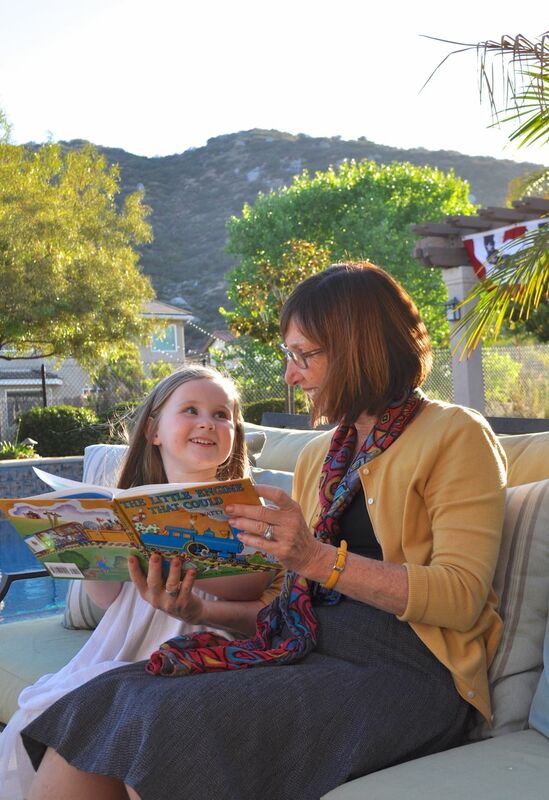 One of my favorite things to do during the summertime is to entertain family and friends. I love to play hostess and put together dinner parties and get togethers. I have so much fun picking out the perfect dishes and dinnerware, decorations, and food for the party. Recently I made a delicious surf and turf meal for my family and parents. 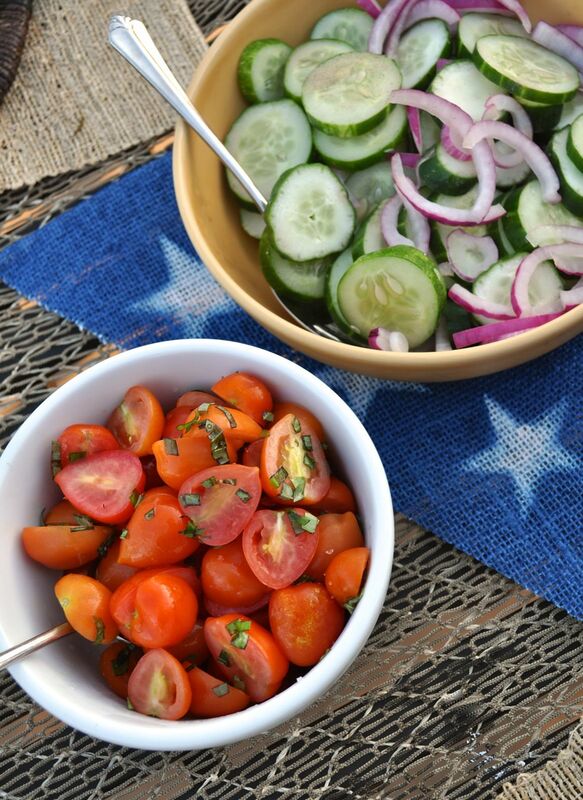 I used lots of fresh, natural ingredients, many of them freshly picked from the garden. 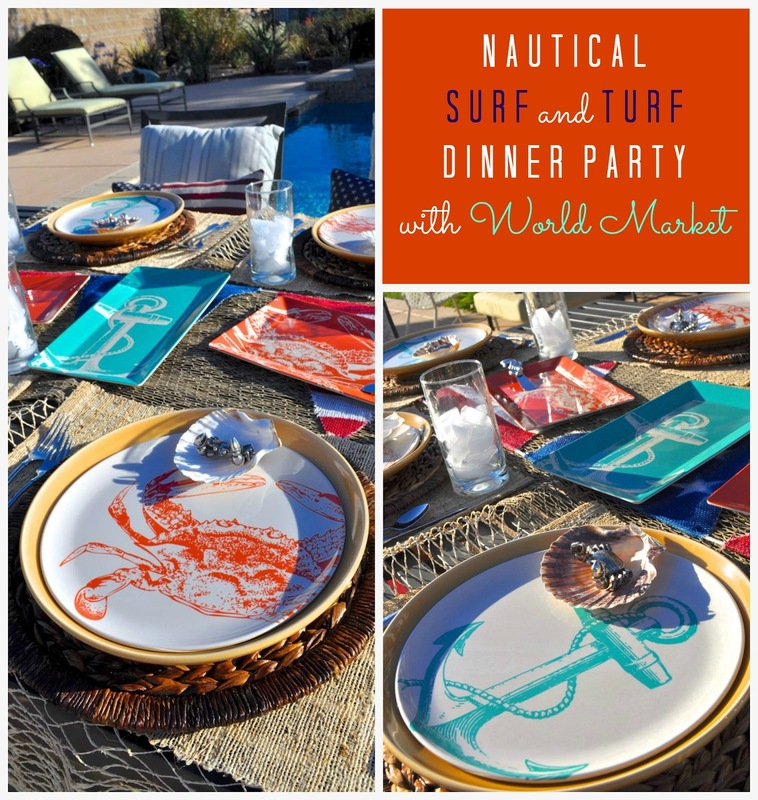 I knew I wanted the dinner to have a nautical theme, so I went to World Market and found the perfect dinnerware and entertaining pieces to use! You might already know I have a slight obsession with anchors (and anything nautical, really). 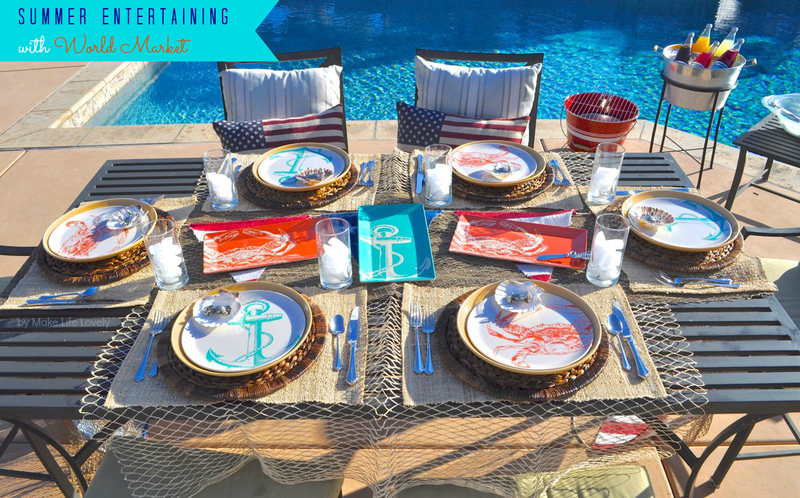 The anchor and crab Seascape Plates (pictured above) screamed out my name, so I bought a set of 8, as well as three of the matching anchor and crab Seascape Platters. One of my favorite little nautical details was this Seahorse Spreader. So cute! 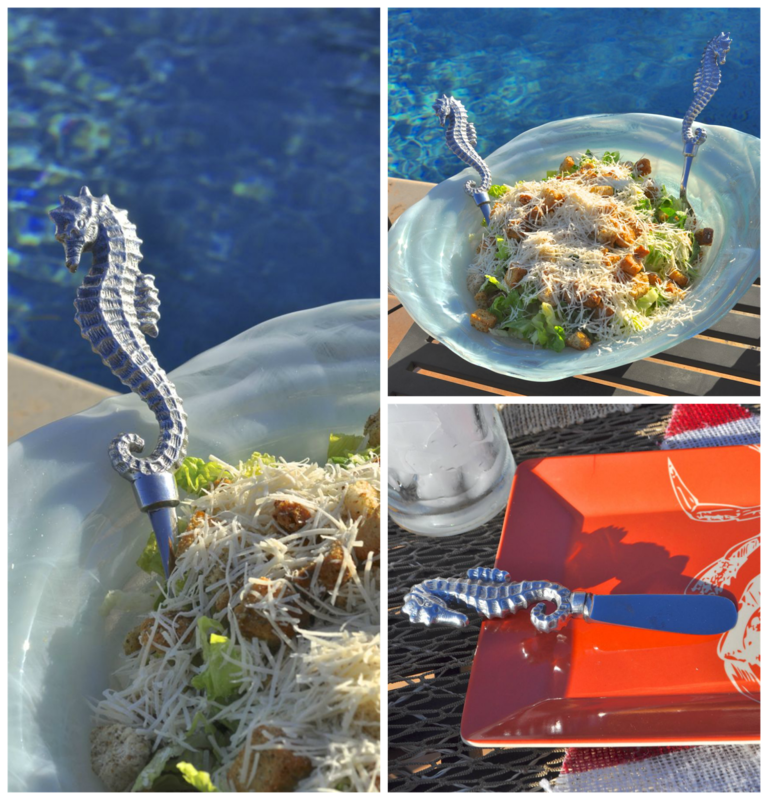 And of course I had to have the matching Seahorse Servers, too, to serve with the Caesar salad. You might also recognize the Lagoon dinnerware from my Coconut Macadamia Mango Crusted Mahi Mahi recipe. I used the large Lagoon Platter for serving the garlic bread, and I used the large Lagoon Serving Bowl to serve the Caesar Salad in. I love the light aqua color, and the way that it almost looks like sea glass… beautiful! 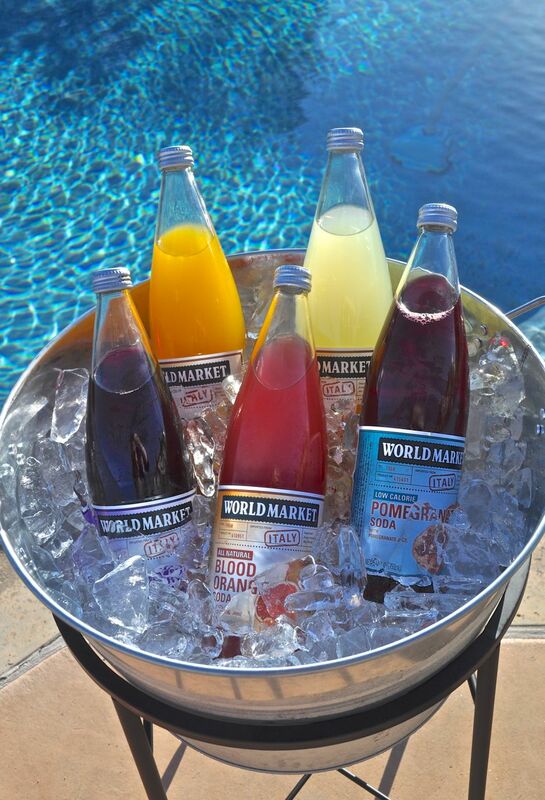 Since no party is complete without World Market’s delicious Italian Sodas, I picked up five different flavors for our dinner. 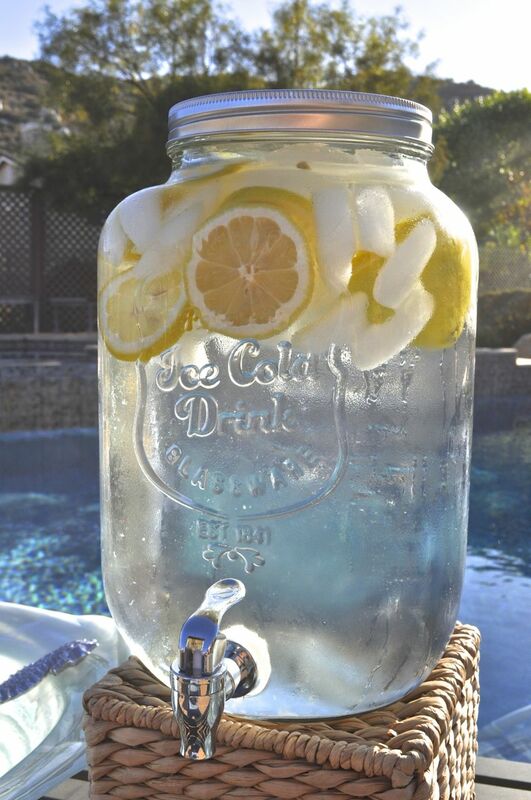 So refreshing! I’ve been looking for a few years (literally) now for the perfect drink dispenser for my parties, and I finally found this beautiful glass drink dispenser at World Market for only $19.99! I bought two, and am absolutely in love with them. 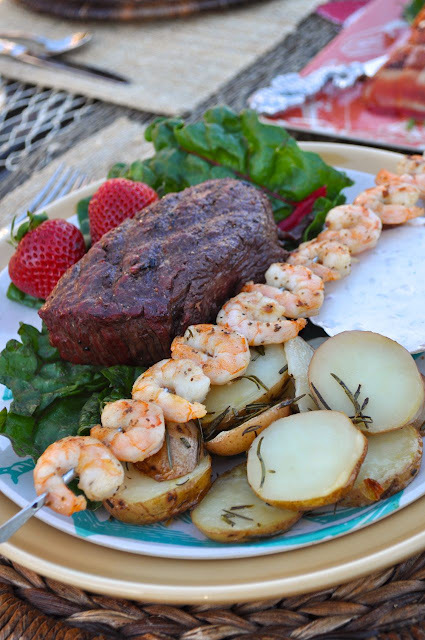 To add to the nautical theme of my surf and turf dinner party, I included a net onto the table and used it as a runner. On top of that, I used my DIY American Flag Garland that I made out of burlap and some spray paint. 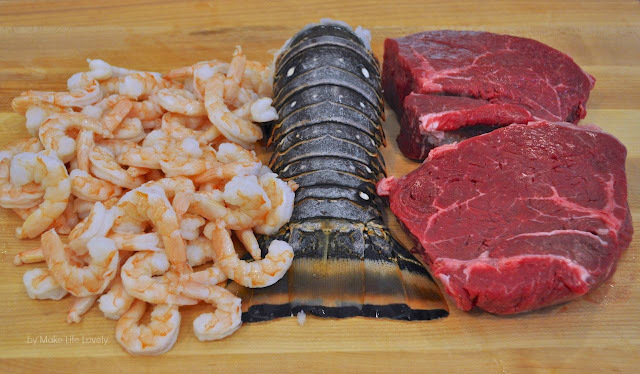 For our surf and turf dinner, I decided to go with shrimp and lobster tail and top sirloin steak. Yummmm!! We grilled the shrimp and steak, and boiled the lobster tail. 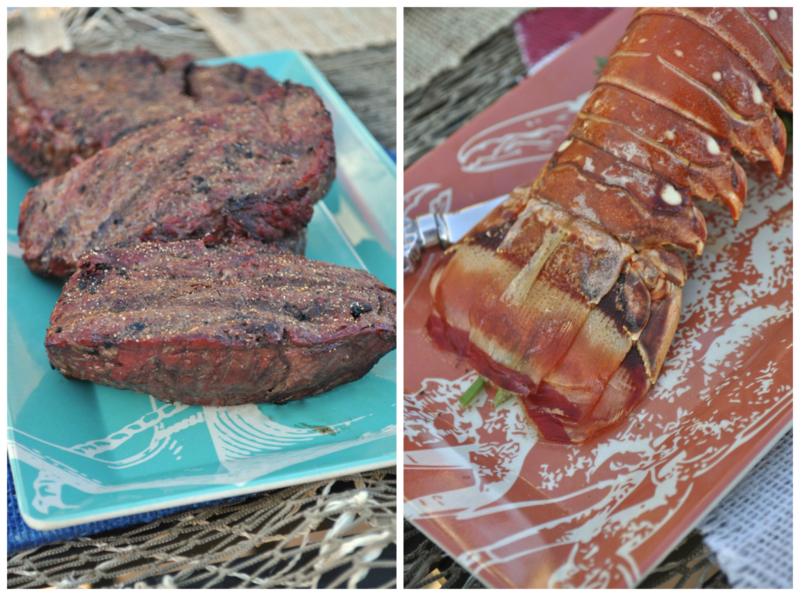 The meat and seafood tasted absolutely perfect! To go with main dishes, my mom and I made some delicious salads. I made a Caesar salad, and my mom went out to the garden and picked fresh tomatoes, basil, cucumbers, and dill to make a tomato basil salad and a cucumber onion salad. The salads tasted so fresh since the ingredients came straight from the garden! 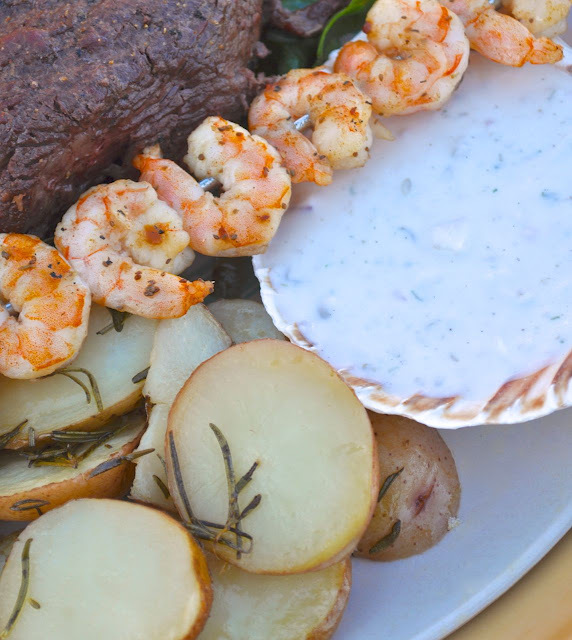 One of my favorite side dishes I created for this meal were the Rosemary Potatoes with a Creamy Caper and Dill Dipping Sauce. I love that I can smother my potatoes in a tangy, creamy dipping sauce without feeling guilty, since this sauce is made with a Greek yogurt base (instead of heavy mayonnaise) and various herbs and spices. No guilt at all! 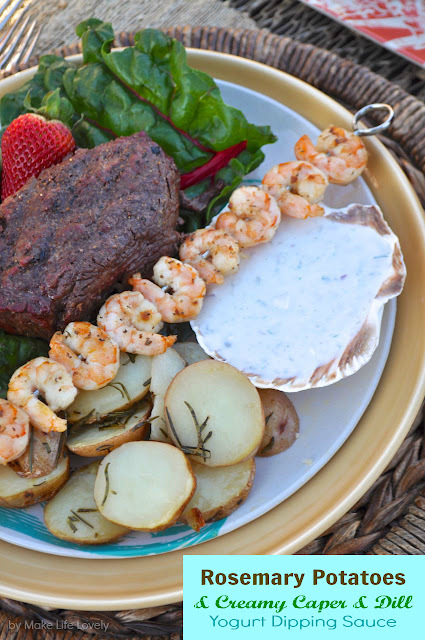 The many different flavors in the sauce all fuse into one, and are amazing with the potatoes, but could also easily be used as a sauce for the shrimp, lobster, or steak. Here’s the recipe so you can try making your own! Mix up the dipping sauce first so that the flavors can meld together while the potatoes are cooking. If you aren’t familiar with capers, they are a small round edible flower bud used in pickling and flavoring fish, seafood, salads, etc. 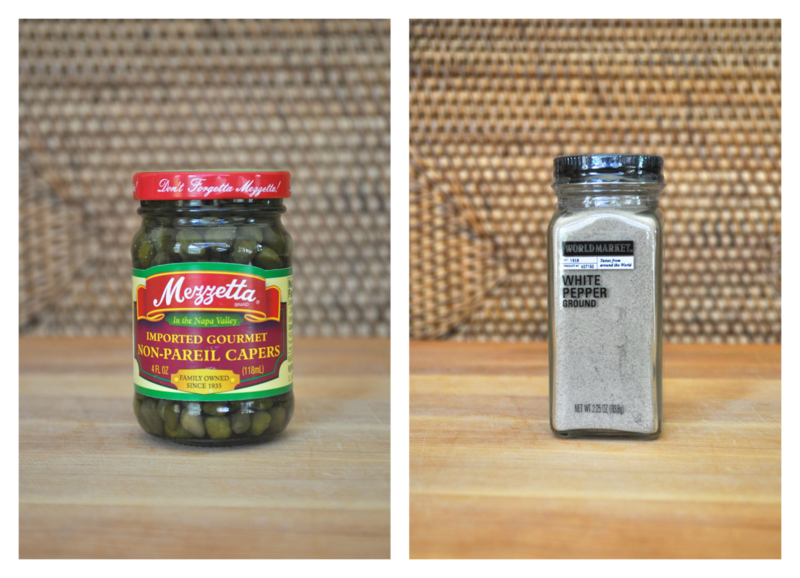 I bought a small jar of capers, as well as my white pepper, at World Market. 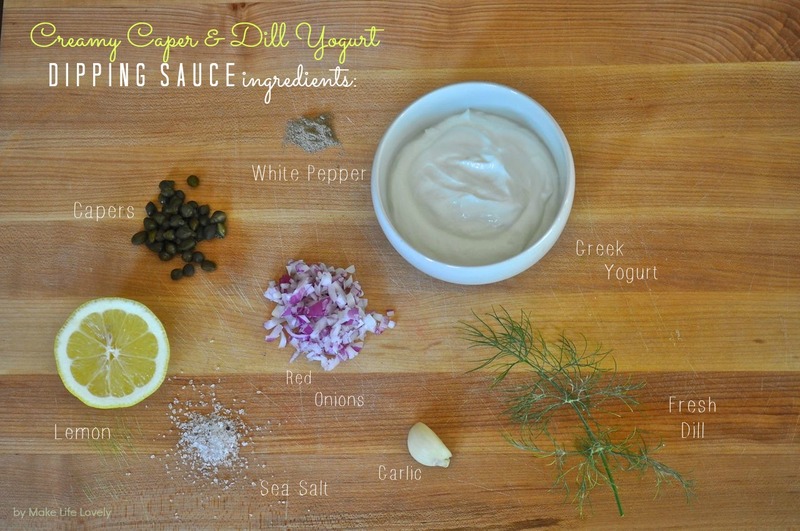 Their white pepper tastes great and is very strong, and is the perfect color to blend right into the creamy caper and dill yogurt dipping sauce. Add all of the ingredients to the Greek yogurt, and stir well to mix in all of the ingredients thoroughly. Place in the fridge until ready to serve. Now on to the potatoes! Wash and slice each potato to about a 1/4″ thickness. Place in baking pan and drizzle with 1/4 cup olive oil. Add the chopped rosemary, sea salt, pepper, and diced onions (if using), and stir to mix. Bake in a 400 degree oven for 20 minutes. Halfway through cooking, carefully add another 1/4 cup of olive oil to the potatoes. 2. 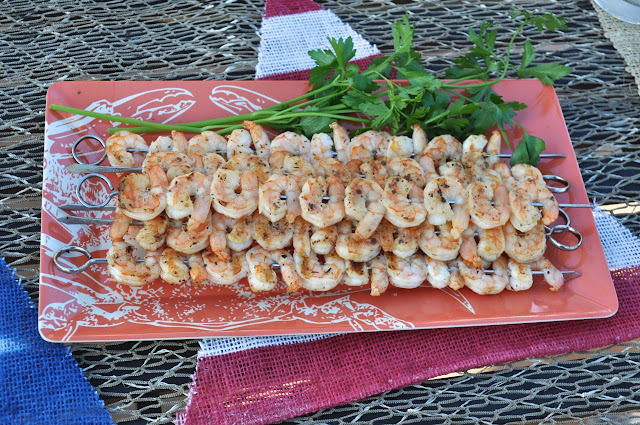 Place them in a grilling basket for about 10 minutes away from direct heat on your grill. This will allow the potatoes to have a slightly smoky, grilled flavor. If you do the grilling option, make sure that the potatoes are away from direct heat, and be sure to check them regularly! 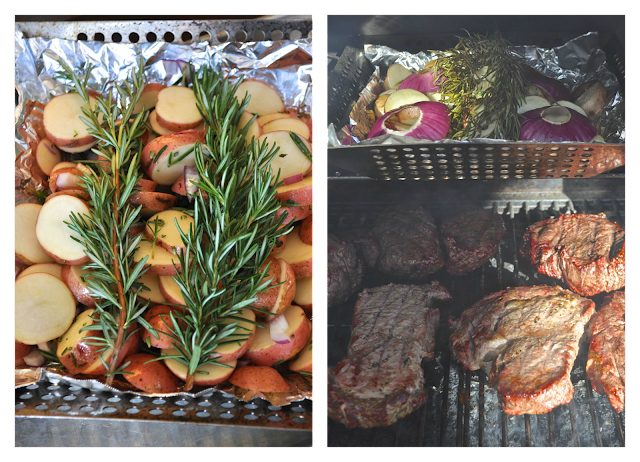 We also added a few large sprigs of rosemary and some large slices of red onion for extra flavor and color. To serve the dipping sauce, I used these lovely large natural baking shells that I bought from World Market. They come all clean and ready for food to be placed, or even baked, inside of them. 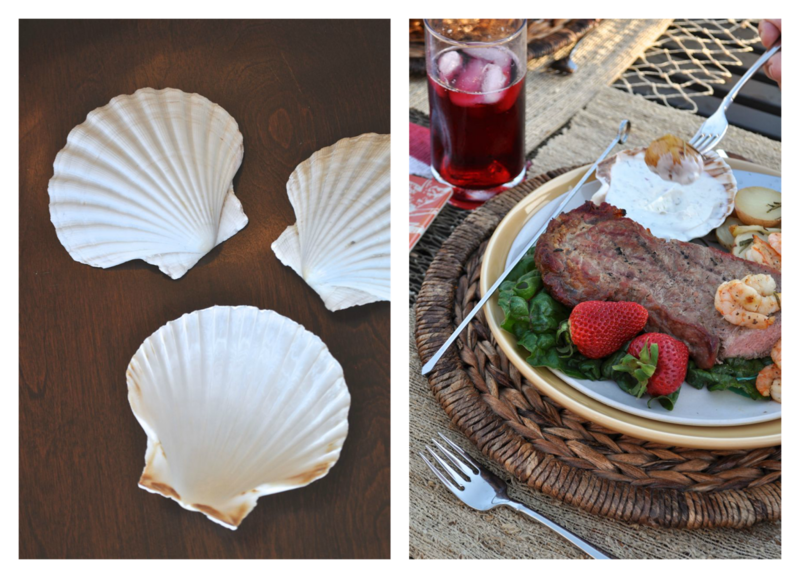 The shells were the perfect size for individual portions of the sauce, and fit in perfectly with my nautical theme! Good food, a loving family, great weather, and World Market!! The perfect combination for an amazing summer dinner party! That was truly an amazing dinner setting and meal you made! We don’t have that Market here in Canada but most of that can be obtained in similar fashion I’m sure! Our Canada Day is July 1st so there’s lots to get done for our celebrations here too! I’m sure your family really loved all of it! Thanks for sharing and swing by when you have a chance to see the wooden lighthouse I made with May Arts Ribbons. I’m here visiting via SNAP Wednesday Linkups! Thanks so much Barb!! Yes, our holidays are very close, aren’t they? Canada Day is on my birthday so I always remember that one even though I’m not Canadian 😉 World Market is one of my favorite places to shop- you can buy online from them if you don’t have any locations near you. Thanks for stopping by, come back soon! Thanks! I’ll have to check out your link party, thanks for the invitation!